I got so terribly annoyed with the "medieval swords weighed between 20 to 30 pounds" nonsense that I decided to do a little calculation. The specific weight of steel is 7850 kg per cubic meter. Let's assume an Oakeshott type XI sword for the moment. Common width seems to have been 4.5 cm. The average thickness is hard to estimate because this information is often not available- I'll assume 5 mm top (based on published measurements), which should give about 2,5 mm average, taking into account fuller and edge bevel. So a cross-section surface of 11.25 10-5 square meters. Assume a disc pommel of 2 cm thick and 5 cm diameter (294 gr), and a cross of 1 cm square and 20 cm long (157 gr), and let's say 50 gr extra for the grip material gives about one pound for the grip. Easy. Now, we'll calculate how long your sword needs to be per extra 500gr (about a pound). For a weight of 0.5 kg the sword would need to be 0.5kg/(7850kg/m3)/(11.2510-5m2) or 55,6 cm long. We have completely ignored distal taper (thickness decreased towards the tip) so this is still a very conservative calculation. So we have about 22.3 inch per pound of sword blade. 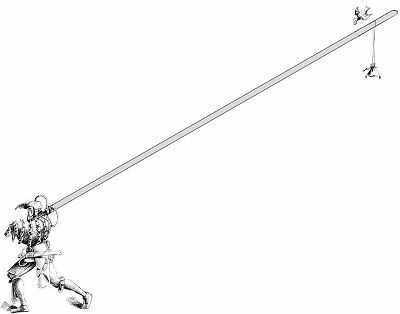 Even if the swordblade was made out of lead (11350 kg per cubic meter), this would only halve the length. A 30 pound sword made of depleted uranium would still be 3 3/4 m long! For verification, let's compare with this: blade length of 33 3/4 so it should weigh about 1+1.51 pounds according to my estimate. The site says 2 pounds 8 ounces, or about 2.5 pounds. Looks pretty accurate to me.